Our Termite Treatment Brisbane Team Guarantee Results with a targeted application! Each of our expert Termite Treatment Brisbane technicians can tell you there are a number of ways you can stumble upon termites in your home. Some people find them cleaning where others might be doing a renovation. Some White Ant Signs are just noticing some bubbling or cracked paint around door jambs or window sills. The most important thing to remember is not to disturb them by poking and prodding. Quickly get a termite treatment by a qualified and insured pest controller. As termites eat timber from inside out, by the time you have noticed the termite damage it could be quite extensive. We recommend all clients be proactive and get an annual termite inspection brisbane, it’s much much cheaper than the cost of repairing termite damage. The best practise when termites are found is to keep the area dark and keep foot traffic to a minimum. Resist the urge to spray them with surface spray. You’ll do more harm than good. We want the termites to think they haven’t been discovered. That way a qualified pest controller can get in and do a thorough termite treatment. Termites are all over Brisbane and the Gold Coast. There is no better or worse area. 1 in 3 homes will have had some sort of termite activity over the next 5 years. If conditions are favourable termites will not stay to a single area. They will follow easy to digest soft timber ensuring there is more than enough food to keep the colony strong. An aggressive specie in a well-developed colony can eat near 500grams of soft damp timber a day! What’s even scarier is people won’t get a Termite Inspection done until they see signs of termite damage. That could be years of damage in the making. When we go to a customer’s home the first thing we do is conduct a thorough Termite Inspection. This will then give us a good indication on the conducive environment that lead them to the house and perhaps even to be able to identify the specie. From this information we can best decide on the application method of the termicide. Termite Treatment Chemicals (Termicide) have advanced significantly in the last few years and that is why it’s important that your pest controller uses the latest chemicals and modern application techniques. We use the market leading Termicide called Termidor which has a unique transfer effect on termites. 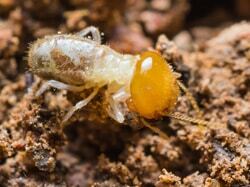 Termites are social insects, they communicate through touch, feed each other and even groom one another. These are perfect actions for a chemical to be passed on down the line. Termidor is a very clever termite treatment chemical. Being low toxic it doesn’t kill straight away but gives the termite time to reach the colony before showing signs of being infected. By then it would have come into contact with 100’s if not 1000’s of termites. All going about their business while passing the chemical deeper into the nest. Within days the chemical is wide spread and having a devastating effect on the colony. The success of this application comes down to how many termites come in contact with the chemical. So to ensure a great treatment they must remain undisturbed until treated. It will be up to your trained brisbane termite technician to decide on the best treatment method. When treating termites inside your home we always used a two treatment approach. 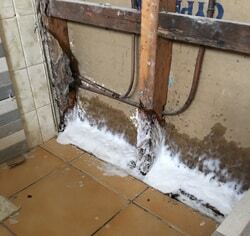 The first initial treatment is carried out then approximately 2 weeks later we will come back and reinspect the area. Once you have had Termites at your homes it is impossible to know if they have been destroyed or have simply moved to another area. Termite Treatments are a localised treatment and only covers the area where the termites were. To better protect your home we suggest have a Termite Management System (Termite Barrier) be installed. There are several on the market so we offer a free onsite quote to see which would be suit your dwelling. This is really where experience matters. Knowing the breeding and feeding characteristics of the different Termite Species means a more targeted approach. Some species are happy to create a subnest in your home where others will only feed on your house and return to a local nest. One of the best things about using Termidor for our Brisbane Termite Treatments is that is it scent free. So termites will pass right on through it without knowing they are affected. This is perfect when the termite specie is external to the property. Leaving tree stumps in the ground to rot away is a big no no. Our Termite Treatment Brisbane Techs will tell you it is our most common call out. Treating active termites in a tree stump. What you are doing is providing termites the perfect environment to build a nest or a subnest. Warm, ample in moisture and hidden away from predators it won’t be too long before the colony builds a super nest. From here they will make mud tunnels underground searching for food i.e. your home. The best practise is to remove the stump and it’s crown before termites find it. However if they are present the same rules apply. Don’t disturb them and don’t pour diesel or sump oil over the stump. It will do nothing. For tree stump treatments we drill and inject termiticide into the stump. Then we drench the local area around the stump. For a Fast and Effective advice contact our Termite Treatment Brisbane Office on 1300077133. We can arrange an express appointment to give you peace of mind. We spray, foam and dust Termites from Brisbane, Logan, Ipswich and The Gold Coast.